Last weekend I went to the Thrift Store with my friend Bobby. I got some quality items. & a whale watching t-shirt. Nothing that I needed but definitely wanted to have. Then this morning I was using one of my hilarious coffee mugs while working on my umpteenth group project when I discovered how my life has taken a turn. This photo was not staged. Cat mug next to a knitting project? 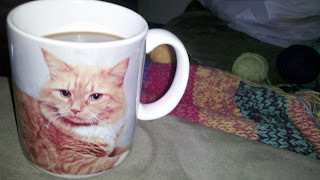 I bought the cat mug because I thought it was so funny. Luckily I'm not wearing my cat pajamas. That would have pushed me over the edge. I almost peed my pants when I read this. <3 you! !